The medical peace organization IPPNW was founded to prevent the use and proliferation of nuclear weapons of mass destruction. In the past decade, this focus has expanded to include conventional weapons currently causing great damage throughout the world, including landmines and small arms. Why should this be of concern to us? Hundreds of thousands of people each year are killed by small arms alone, with millions more injured and maimed. The Red Cross reports that 90 percent of all victims of war die from the use of small weapons, two thirds alone from rifle bullets. Most of theseinjuries and deaths occur in countries in the global South. Many wars are fought over the interests of wealthy industrialized nations, and it is the guns we produce in our countries that kill. The traumatization of the wounded and their families goes far beyond physical injury. Heckler & Koch, one of Europes’ leading small arms producers, is based in the pretty little town of Oberndorf am Neckar in the Black Forest. Its weapons are exported wherever sales are possible. 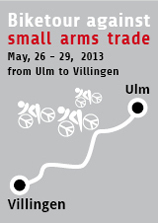 In Villingen-Schwenningen, not far from Oberndorf, an international congress on the issue of small arms will take place from May 30 to June 2, 2013. Organised by IPPNW in cooperation with the campaign “AktionAufschrei – Stoppt den Waffenhandel!”, experts and members of many organizations will discuss the effects of these weapons. International guests from, among other countries, Kenya, Iran, Nepal, Switzerland, India, Australia and the USA will share their knowledge and know-how. There will be lectures, panel discussions and workshops about the social and health effects of the use of small arms and the global arms trade, as well as about future activities and campaigns to stop arms exports. You are hereby cordially invited to participate.